Here at 10,000 Birds we think it is very important that we tackle the big issues of the day, the issues that can effect everyone, birder or not. And if there is anything that is constantly on everyone’s mind in recent days (and that we are constantly getting email inquiries about) it’s the inside of a Red-winged Blackbird‘s mouth. “What does it look like?” is what everyone wants to know, and, occasionally, someone asks what it would be like to make out with a Red-winged Blackbird (we forward those emails to Mike). So what exactly am I trying to say here? 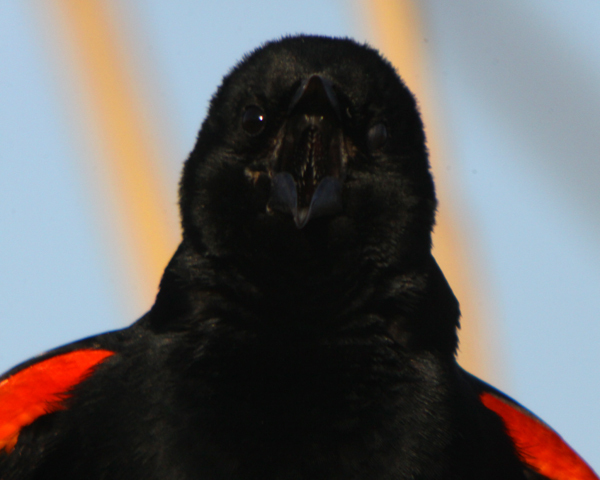 Well, I am pleased to announce that after exhaustive field research, we have determined that the inside of the mouth of a Red-winged Blackbird is neat. Please see below for confirmation. See? Neat! Told you so…and, just for the record, so far as I know, Mike has never made out with a Red-winged Blackbird, though we aren’t sure about Bobolinks. Now that I’ve seen the inside of a blackbird’s mouth, I’m not likely to make out with one, thanks. Slow day on the bird front eh ?? Mike, you haven’t seen a Wagtail yet, I presume?